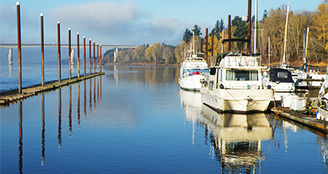 McCuddy's Steamboat Landing Marina is situated on the banks of the Columbia River east of the I-205 bridge opposite Government Island State Park. 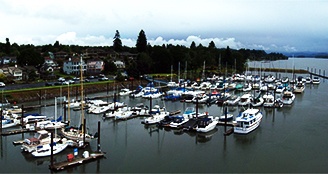 Our marina has 150 floating concrete boat slips ranging from 24' to 40' and we can sometimes accommodate larger vessels. All slips have water and electric hookups. Other amenities include a free self-service pump-out station, fish cleaning station, dock boxes, 24 hour restrooms, free wifi, and free vehicle parking. The marina is located within the Steamboat Landing gated community and is accessed by key cards provided when you rent a slip. We rent slips on a daily or monthly basis. The marina office is open Tuesday through Saturday from 8 am to 4 pm, so give us a call or better still, drop by the office and we'll show you around. 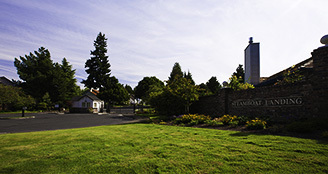 The office is closed Sunday and Monday.